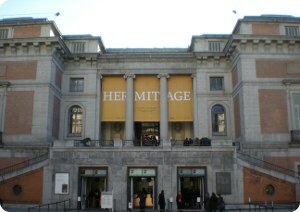 The Prado Museum is renowned as being the largest art gallery in the world. It is now one of Spain's major tourist attractions. It also exhibits sculptures, drawings, coins and other works of arts, but it is undoubtedly its large collection of paintings which has given it fame worldwide. It houses more than 8,600 paintings, of which they exhibit less than 2,000 because of lack of space available. 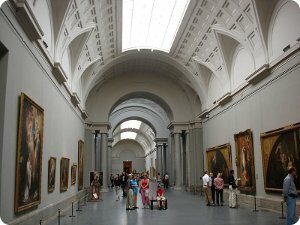 Many museums throughout the world have less artistic riches in their halls than the Prado Museum has in storage. From then to this date, the works of art have survived several challenges and were transferred several times during the Spanish Civil War, ending up in the Swiss city of Geneva and being returned to Madrid during the Second World War. 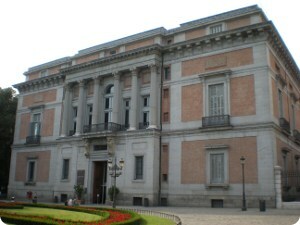 Nowadays, its treasures are exhibited in two adjacent buildings: the Villanueva Building where the majority of the works are housed, and the Casón del Buen Retiro. The multiple origins of the paintings of the Prado Museum allow us to classify its works according to the nationality of the original school. Italian: has among others, works by Andrea Mantenga, Sandro Botticelli, Rafael, Andrea del Sarto, Correggio, Lorenzo Lotte, Tintoretto, Verones, Tiziano, etc. Flemish: with works by Rogier Van Der Veyden, Jochim Patinir, Quentin Metsys, Bernard Van Orley, Hieronymus Bosch, Pieter Brueghel, Jordaens, etc. German: French and Dutch schools with works by Lucas Cranach, Albert Dürer, Nicolas Poussin, Claudio de Lorena and Rembrandt. Spanish: Velázquez, Goya, Murillo, Bartolomé Bermejo, Pedro Berruguete, Luis de Morales, El Greco, Juan B. Maino, José de Ribera, Alonso Cano, Caudio Coello, Zurbarán, Luis Meléndez, etc. Monday to Saturday: 10:00 h to 20:00 h.
Sundays and holidays: 10:00 h to 19:00 h.
Reduced opening hours (January 6, December 24 and 31): 10:00 h to 14:00 h.
January 1, May 1, and December 25. * The galleries are cleared 10 minutes before closing.